Per Heiselberg, Professor at Department of Civil Engineering Aalborg University, Denmark was our eminent guest speaker on the topic the reasons of 'overheating in low energy buildings and the impact of solar shading'. See below extract of his presentation: 'Solar shading evolving from component level tot concept level'. Peter Winters, President ES-SO elaborated on the involvement of 'ES-SO as EU partner in energy efficient buildings'. In Italy, ASSITES reinforced its organisational working by setting up a collaboration framework with UNICMI, the National Union Industries of Metalworks, envelope and window frames. It also informed about the Italian legislative decree 2013 on solar shading as energy efficient measure used for the release of the EPC- Energy Performance Certificate. In the late '90 The Swedish Solar Shading Institution- SSF came up with the well-known Parasol tool in close collaboration with the Lund University. 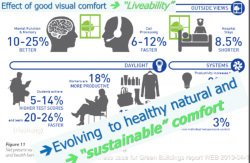 Today the energy consumption depends a lot on the choice of the various technical solutions that will be used in a holistic way in the building. SSF recently signed a contract with EQUA to develop the next generation simulation tool, called IDA ESBO-early stage building design optimization. 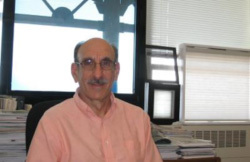 Steve Selkowitz, Head of the Building Technologies Department at Berkeley Lab, U.S. has been voted the 49th Award of Excellence winner by the editors of Engineering News-Record for his contribution on energy efficiency. Steve Selkowitz is the 'Steve Jobs' in the world of energy-efficient buildings; he has literally changed how to design, build, and inhabit buildings the world over. See his acceptance speech on April 3, calling for industry and academic coordination to vastly improve building energy efficiency. ES-SO works closely together with Steve on several projects and is proud to benefit from his experience and deep knowledge. 'Warming of the climate system is unequivocal' confirms the alarming new Fifth Assessment Report of the IPCC - Intergovernmental Panel on Climate Change, pointing out that no region of Planet Earth will remain unaffected. The IPCC reviews and assesses the most recent scientific, technical and socio-economic information produced worldwide relevant to the understanding of climate change. The IPCC is preparing the Fifth Assessment report, which is being released in phases from September 2013 to October 2014. The key-messages of the latest reports will be presented on Tuesday 6th May 2014 in Brussels. 'The business case for green building: a review of the costs and benefits for developers, investors and occupants', Report of the World Green Building Council, 2013, download here.